Article first published as TV Review: THE DEFENDERS on Seat42F. You may have been waiting impatiently for years now for Netflix’s Marvel’s THE DEFENDERS, the small screen version of the Avengers team-up. After all, the first series in the build-up, Daredevil, was released back in the spring of 2015. Through Jessica Jones, Luke Cage, a second season of Daredevil, and yes, even the less-lauded Iron Fist, fans of the Marvel Universe have been lapping up the installments, waiting eagerly for these D-list (see what I did there?) heroes to come together. But just because THE DEFENDERS finally went public today doesn’t mean the wait is entirely over. 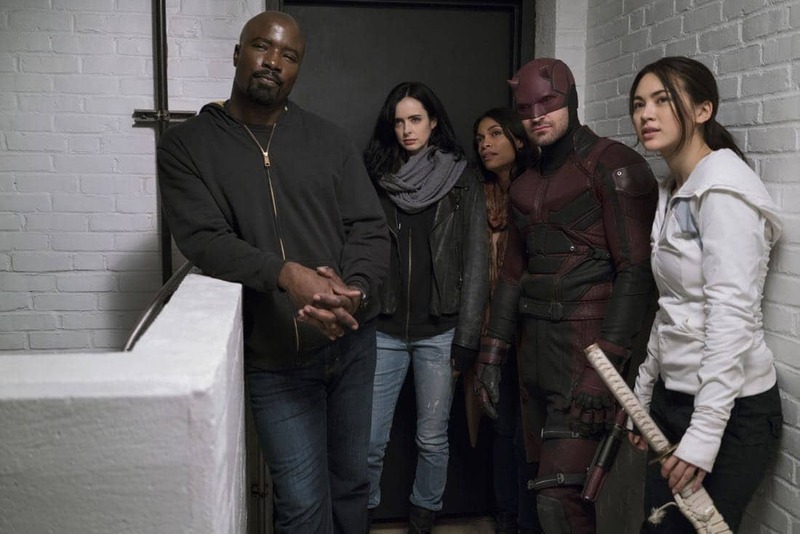 THE DEFENDERS is an eight-episode miniseries, and thus takes its time getting to what the fans want: the four primary characters meeting one another. Instead, episode one is all about checking in with where our people are and meeting the villain. It isn’t until late in episode two that any of the quartet run into one another, and it’ll be later still before they get together as a group. I like this waiting strategy more than I thought I would. Yes, I would rather THE DEFENDERS had arrived earlier. But now that I’ve begun watching, I want the story to progress naturally. It takes time for the story to weave each individual together, and that’s OK. That’s how it’s supposed to work. Danny Rand, a.k.a. Iron Fist (Finn Jones) is seen first, kicking off the event with an action-packed battle in the sewers. Although we don’t see the face of his shadowy opponent, we do know who she is, which will become clear soon enough. He and Colleen Wing (Jessica Henwick) are still hunting The Hand, and their mission, while starting overseas, soon brings them back to New York. Danny isn’t the only one on a mission. Luke Cage (Mike Colter), fresh out of prison, begins looking after a kid around his neighborhood that needs help. Meanwhile, Jessica Jones (Krysten Ritter) takes a case that leads her to encounter the same mysterious woman from the opening. This isn’t a surprise, because it shouldn’t take the audience long to figure out that all three investigations are leading to the same central baddie. They are well woven, and this is the primary reason I’m fine with THE DEFENDERS taking a while to bring its leads together. In fact, even as other characters like Foggy Nelson (Elden Henson), Misty Knight (Simone Missick), and Hogarth (Carrie-Anne Moss) cross worlds, Matt Murdock (Charlie Cox) is the hold-out outsider. Having rejected the mantel of Daredevil and busy with pro bono legal cases, he’s the one remaining unaware of what’s happening. This will not last, as the end of the second hours reveals, but it’s cool to have someone not falling into the pattern that the others do. I have to admit, upon realizing that The Hand would be the villains in THE DEFENDERS, I wasn’t very excited. After all, Iron Fist, though not as terrible as some have claimed, is the weakest link, and its recently-released season featured The Hand prominently. Yes, they also appeared in Daredevil, too. But why bring over the criminals from the series no one liked? That feeling goes away the moment we meet Alexandra (the great Sigourney Weaver), a woman so formidable that even Madame Gao (Wai Ching Ho) cowers before her. Alexandra does much with few scenes and few lines, a great presence that instantly makes The Hand interesting again. She exudes danger as much as she does gravitas, and she is the perfect foe for this adventure. Two hours in, I am hooked. While not as powerful in its messaging as Jessica Jones or Luke Cage, it is much more gripping than Iron First or Daredevil, and its fewer number of episodes makes for a carefully-plotted, well-paced miniseries. It balances the faces we want to see with the story that needs to be told, and somehow combines the tonality of all of the series it brings together. It even finds a way to make the unavoidable fight between heroes caused by a misunderstanding work. It’s been worth the wait, and I plan to savor the remaining installments. I recommend you do the same. THE DEFENDERS is available today on Netflix.